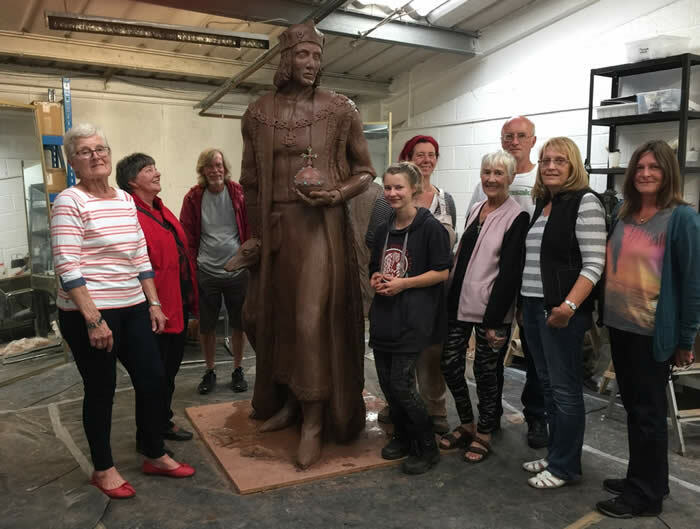 HENRY VII STATUE APPEAL ! 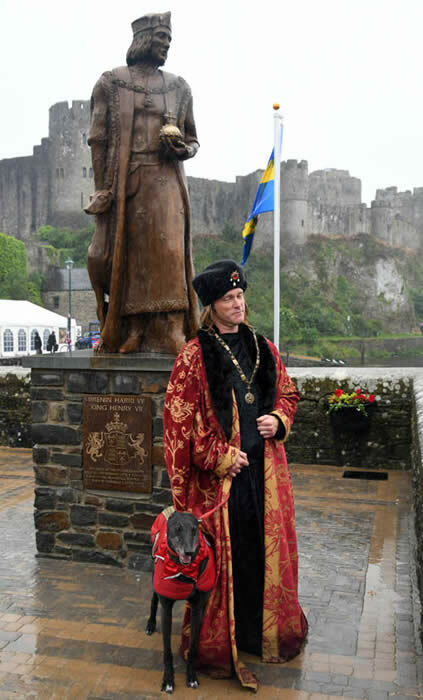 A statue of Henry VII - for so long an aspiration for so many - became a reality on June 10th 2017 when the Lord Lieutenant of Dyfed unveiled Henry's statue on Pembroke Mill Bridge. 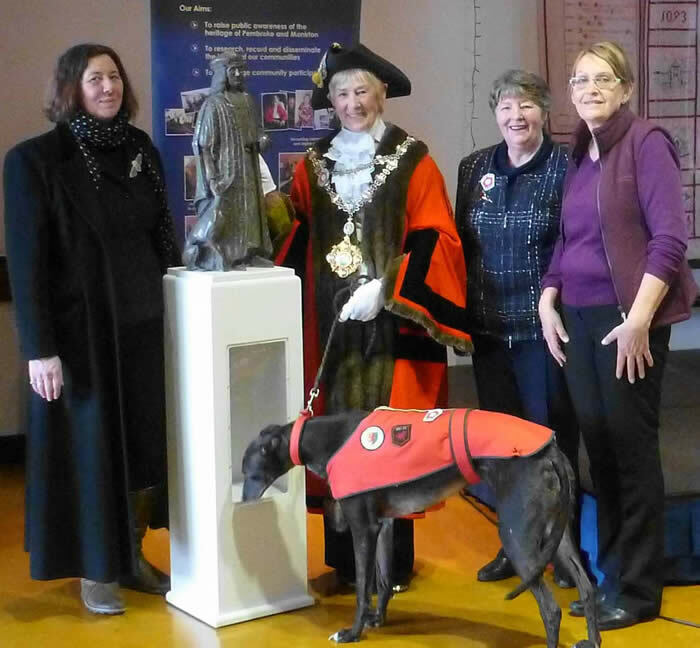 Despite the rain, large crowds assembled to witness the event and view the stunning statue created by Harriet Addyman. 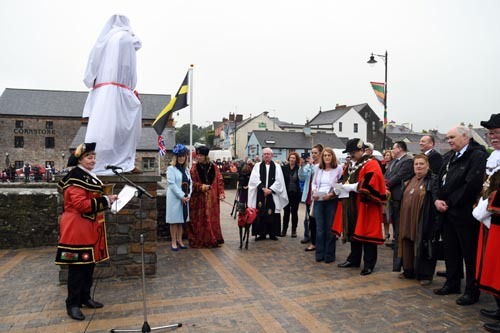 Following the unveiling a programme of activities took place on the Quay, organised by Pembroke Town Council and from 5pm bands played in the marquee throughout the evening until 10.30pm. 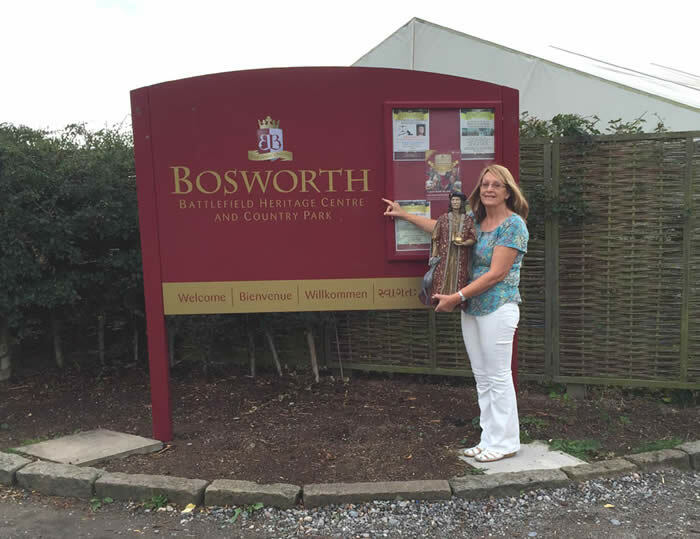 All agreed it was a day to remember! 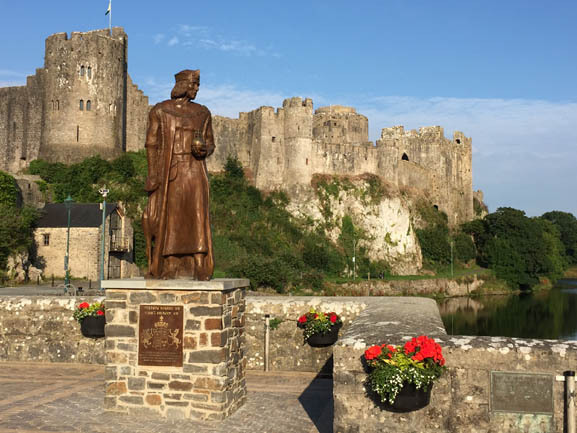 A statue fitting for a great king! 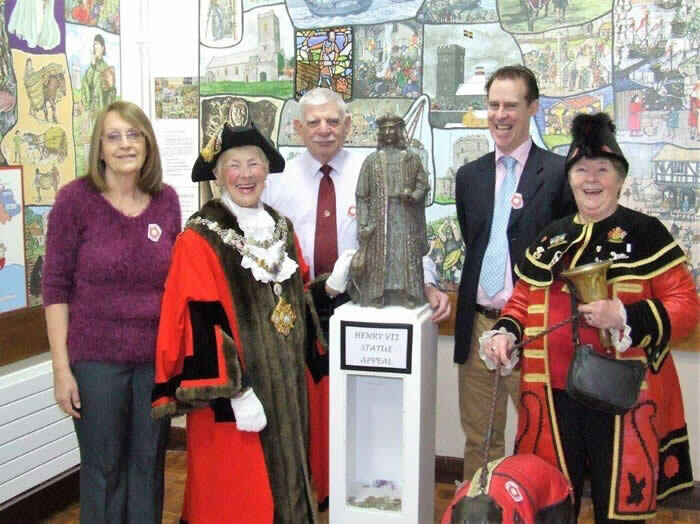 In the picture left: Cllr Rose Blackburn (Town Crier), Tony Riches, Pembroke Mayor Pauline Waters, George Lewis, Terry Breverton, Cllr Linda Asman and Nathen Amin. 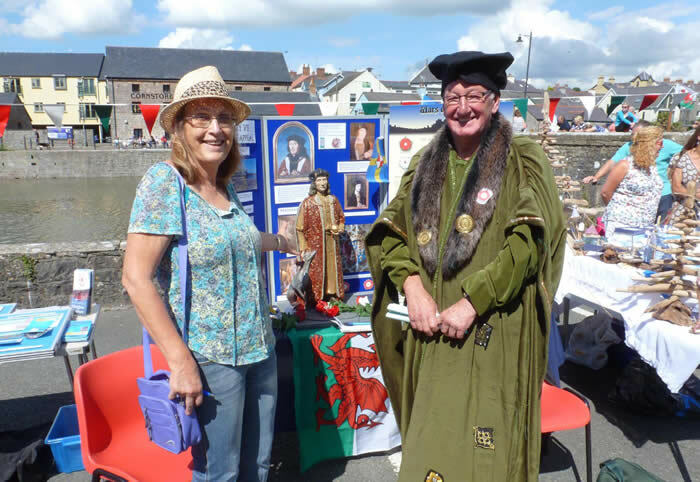 On the right, Terry Breverton talks on 'Jasper and Henry in Pembroke: birth of the Tudor dynasty. 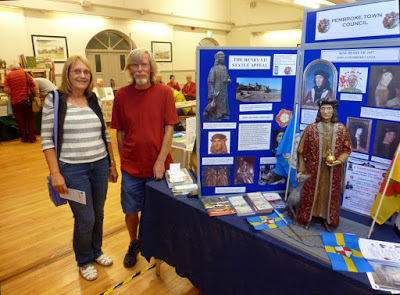 On Saturday October 3rd a public meeting was held in Pembroke Town Hall to launch the campaign for a statue of Henry VII. 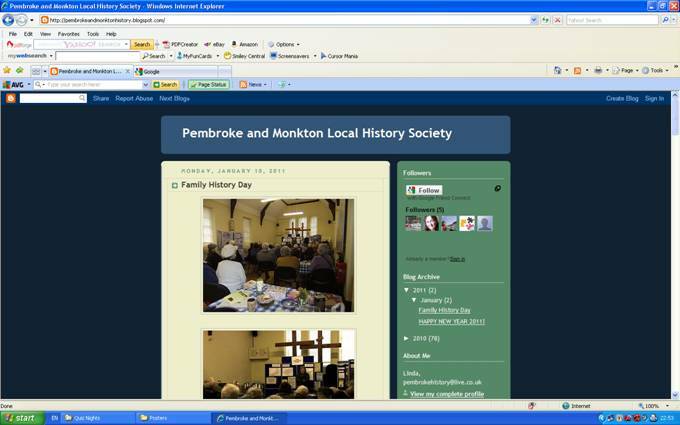 The event, sponsored by Pembroke Town Council, was intended as a public consultation to invite discussion on the statue project and was organised by Pembroke & Monkton Local History Society which also hosted a Coffee Morning for the occasion. 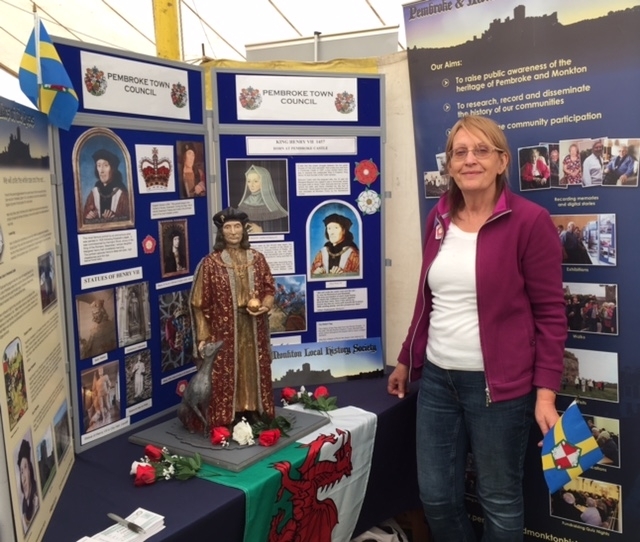 Proceedings were opened by Pembroke Mayor, Pauline Waters, who highlighted the importance of a Henry VII statue in promoting Pembroke as the birthplace of the Tudor dynasty. 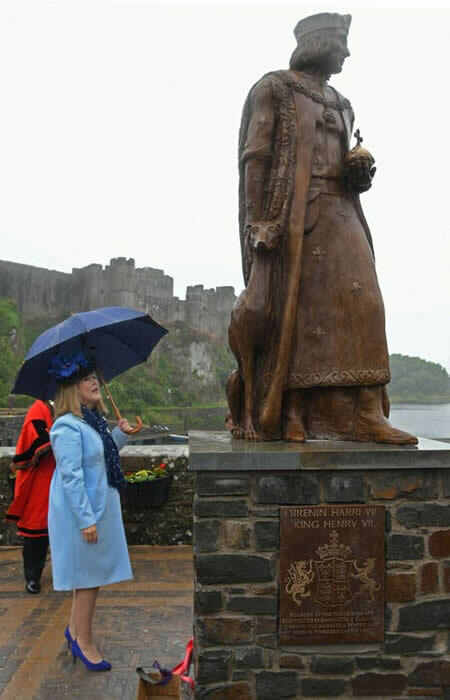 She thanked all those present for attending and for the support not only of the Town Council which has commissioned the maquette, a miniature of the intended 8 foot high statue, but also Pembrokeshire County Council which agreed a Regneration grant of £20K provided we could match fund the amount. 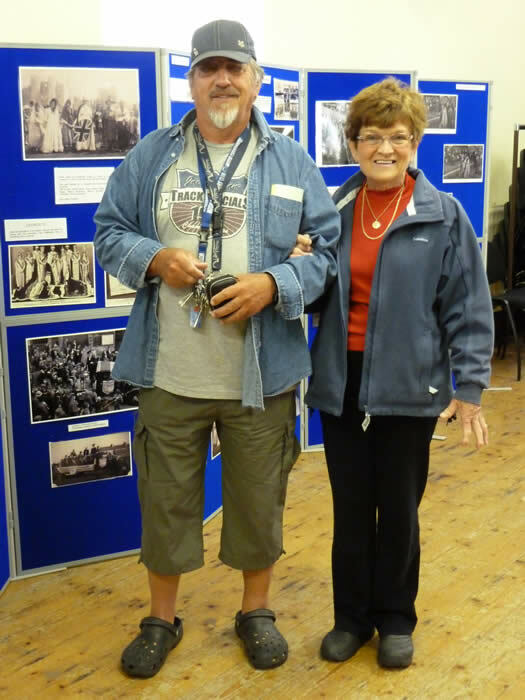 A public fundraising campaign was launched to raise £20,000. with Gracie, the Town Dog. 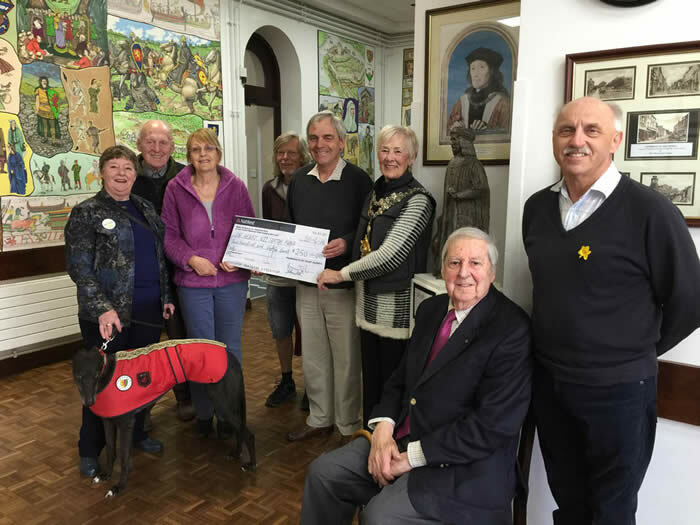 A great boost was given to the Henry VII Fundraising Appeal with a very generous donation of £5000 from the Valero Refinery and the pledge of £5000 in the coming year. 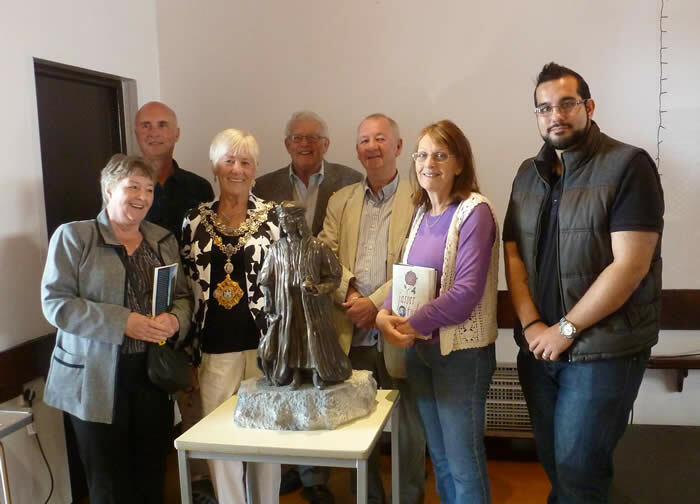 Valero public affairs manager Stephen Thornton came to Pembroke Town Hall to meet with our Fundraising Committee and see the Henry VII maquette. 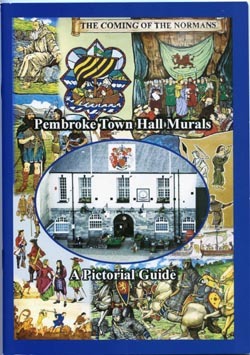 Said Stephen "Valero is proud to offer its support to this project, which will hopefully boost the pride we have in Pembroke's special place in history and spread the story to audiences further afield." 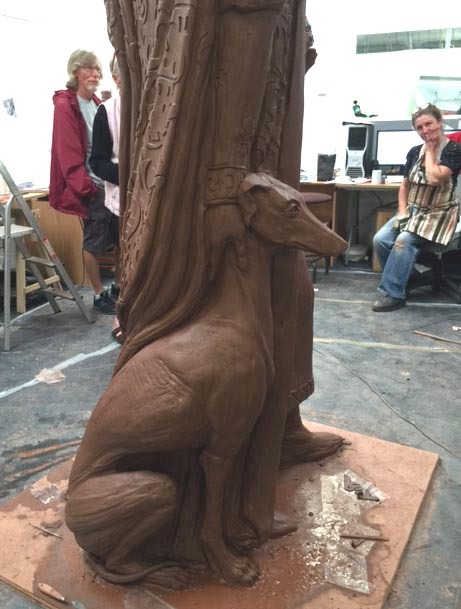 Henry Tudor and visit the maquette. 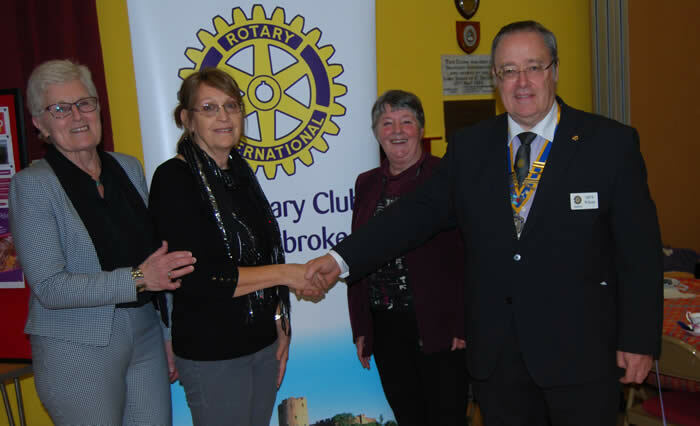 And the Rotary Club of Pembroke - Chairman Emyr Howells is seen here with Statue Committee members Daphne Bush, Linda Asman and Rose Blackburn. 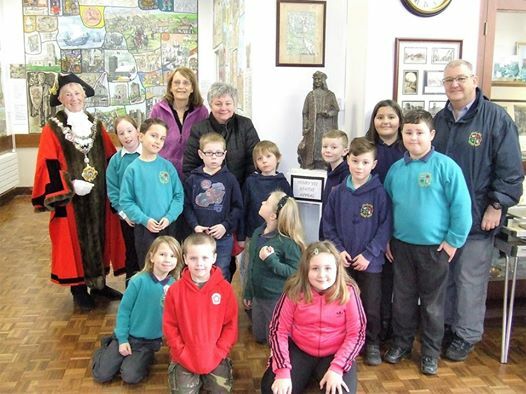 And the individual donations of countless members of the public who helped make up the £20,000 we required to match fund the grant given to us from Pembrokeshire County Council's Town Centre Support Programme. 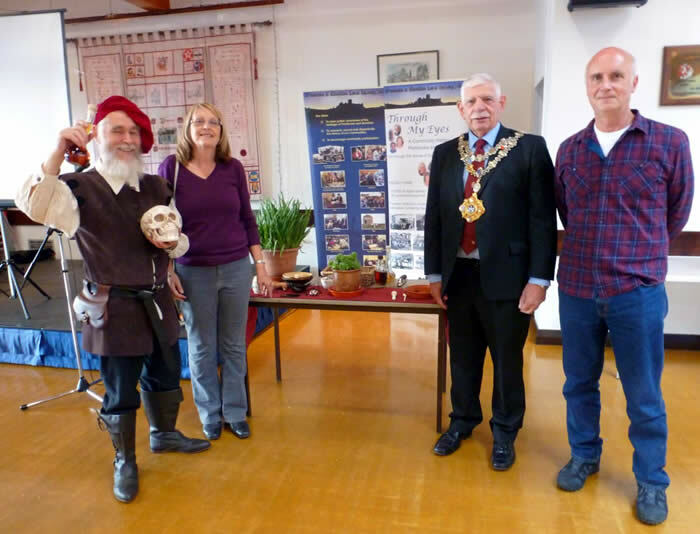 Over one hundred people attended our Tudor Morning in Pembroke Town Hall on October 1st. 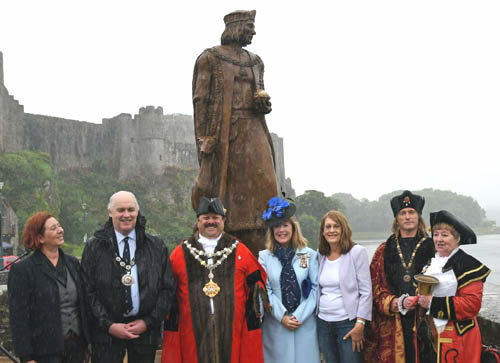 Opened by Pembroke Mayor Cllr Dennis Evans, proceedings began with an update of the Henry VII Statue by Society Chairman Linda Asman who said she was delighted with the overwhelming community support for the project. It was an eventful morning with two excellent speakers. First, Rev. 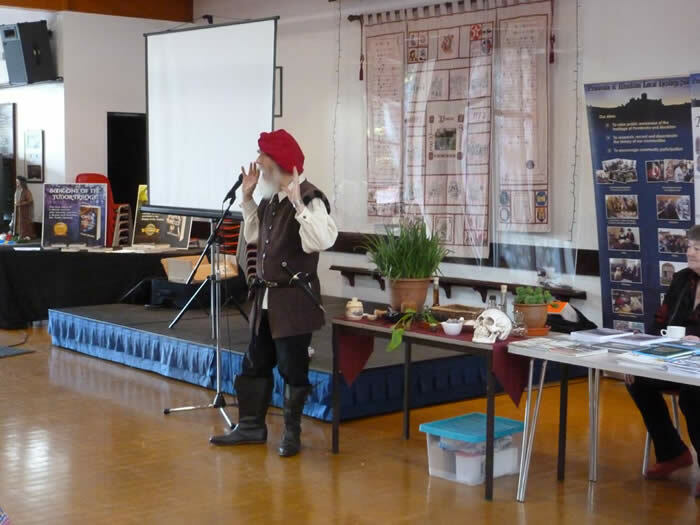 Luke Holden spoke about herbs and healing in Tudor times. 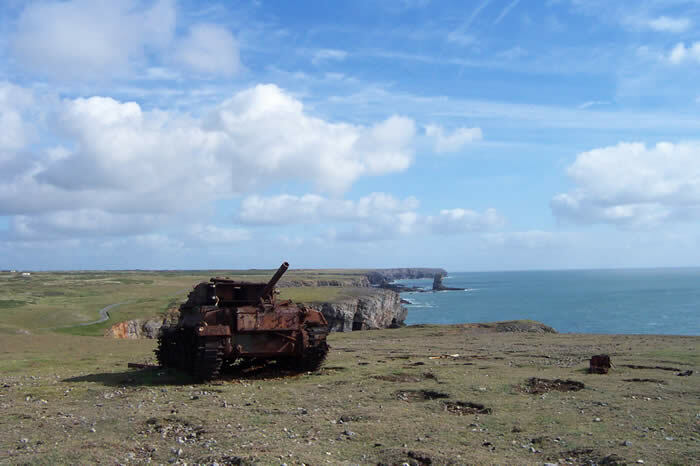 Luke, who lives in Llanelli, has a background in Ancient and Medieval History, Art History and Archaeology. 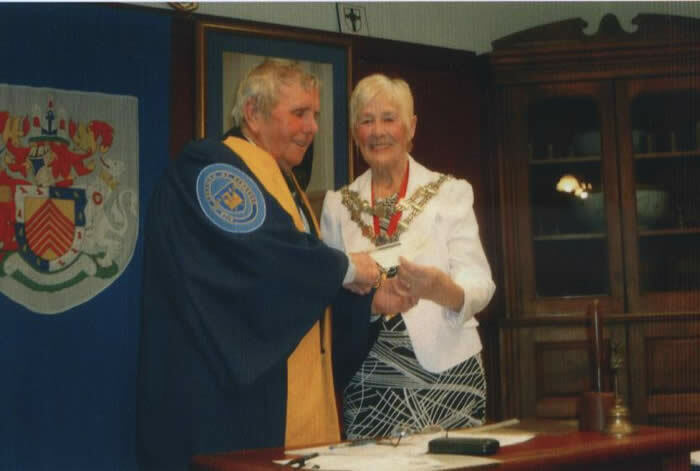 As well as being a Greek Orthodox Priest, he has enjoyed a varied career which included teaching and running a farm small holding from which grew his interest in plants. 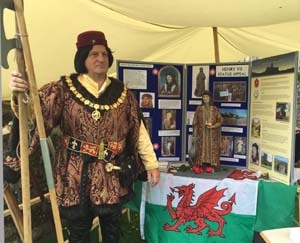 Luke regularly takes part in Tudor re-enactments assuming the character of Welsh Tudor Herbalist Luke ap Pagrig. 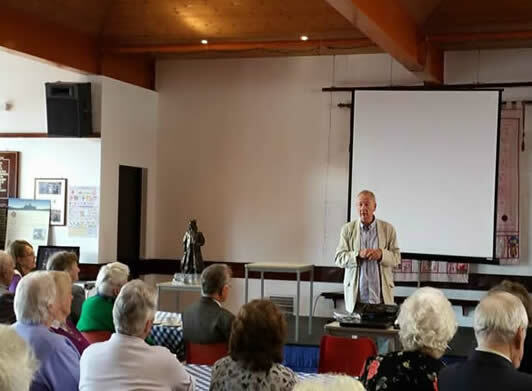 Second guest speaker was Tudor author Tony Riches, who took part in the Henry VII Statue consultation last October and subsequently became involved in the Statue Committee. 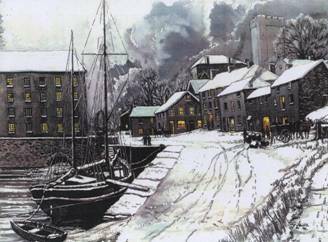 The first book of his Tudor Trilogy, OWEN, explored the life of Owen Tudor, grandfather of Henry from whom the Tudor dynasty descended. 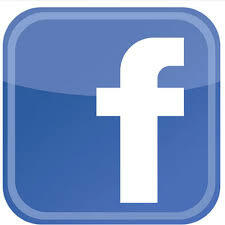 It topped the Amazon historical fiction charts in the UK and US – and reached number one in Australia. Since then JASPER has also become an international best-seller and Tony is now writing the final book, HENRY. Tony kindly denoted a copy of OWEN to the Raffle. 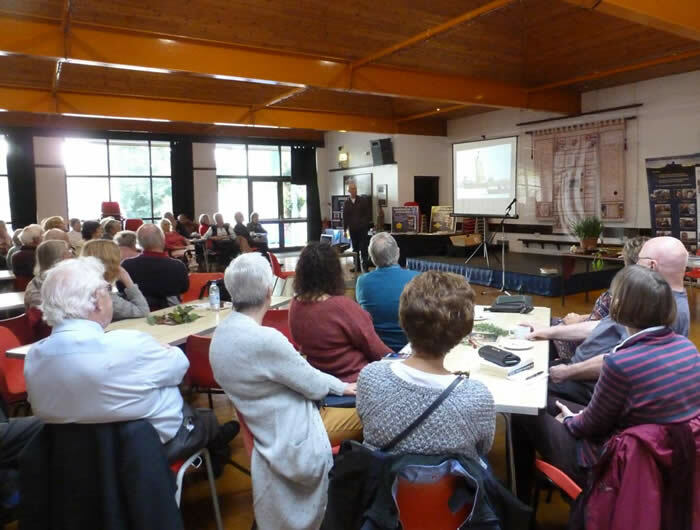 Between speakers, the audience were able to sample some Tudor baking as the committee had been studying appropriate recipes to go with the theme. 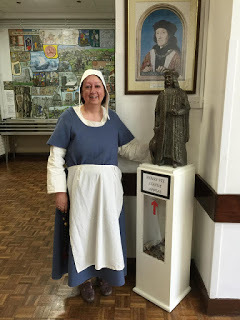 The event was free at entry but funds were raised on sales of coffee and raffle - in all £226 was raised and this will be given to the Henry VII Statue appeal. 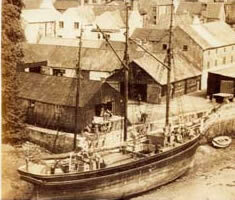 David James 'launches' his model of Henry VII's warship the Mary Fortune. 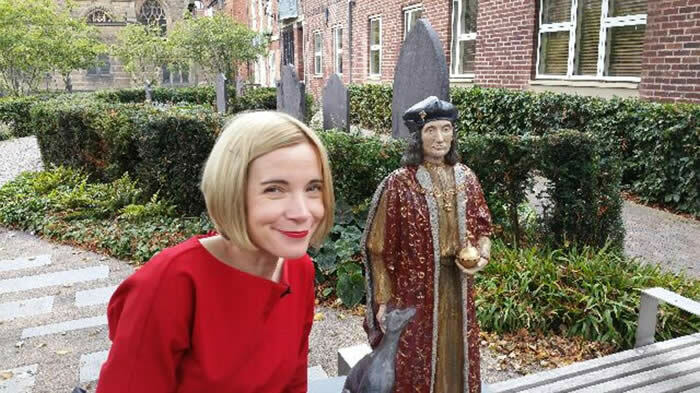 Our 'Portable Henry' maquette has even been to Leicester to appear on television with Lucy Worsley!